Dry or moist woods. Fields and thickets. 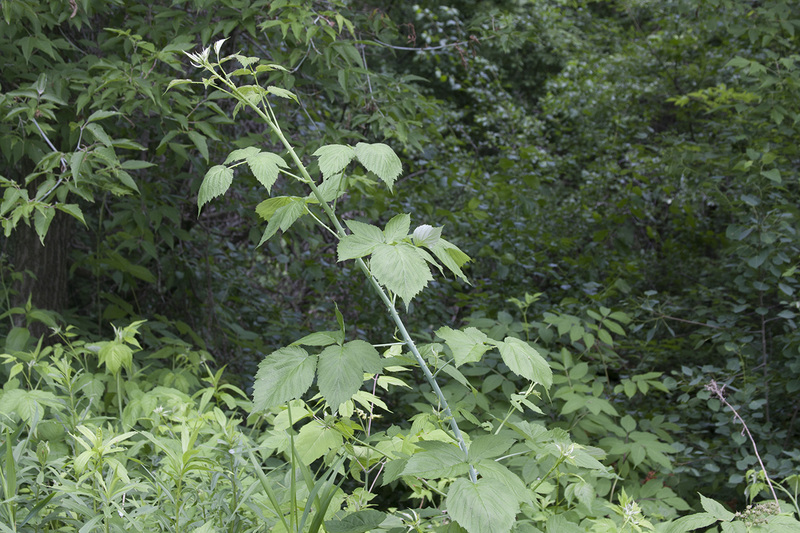 This is a 24″ to 84″ tall, erect to arching bramble that rises on multiple stems from a woody, branching taproot. It often forms dense colonies. They often form impenetrable thickets. A series of biennial stems (canes) are sent up from a perennial base. First year stems (primocanes) do not flower. They grow to their full length, which can be up to 13′ long. Longer stems arch to the ground and root at the tips. 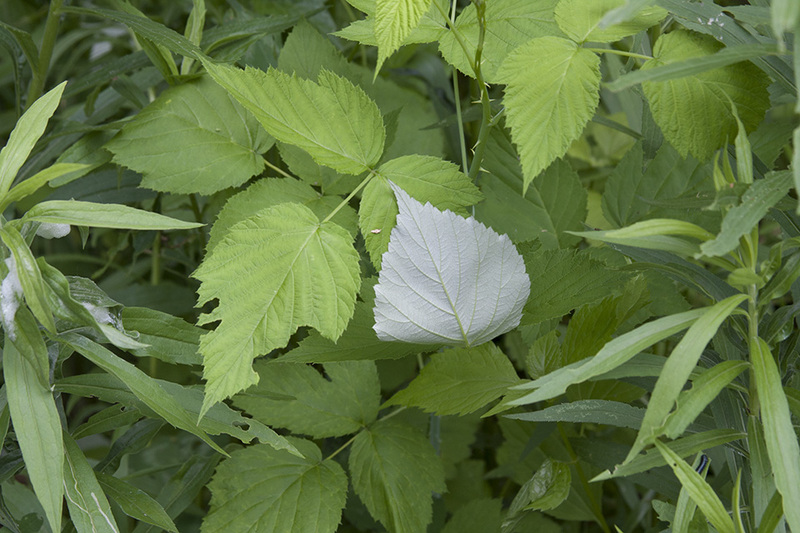 They are initially light green and are covered with a whitish, waxy coating (glaucous). They are round (not grooved), and become woody, at least near the base. They may turn reddish-purple in strong sun. Over the winter they turn reddish or brownish and become woody. They are sparsely covered with prickles, with just 0.2 to 1 prickle per centimeter (⅜″). The prickles are ⅛″ to 3 ⁄16″ long, broadened at the base, and strong enough to tear skin. They are shaped like a cat’s claw but not as curved. The canes do not have bristles, hairs, or glandular hairs. The leaves are alternate and deciduous. 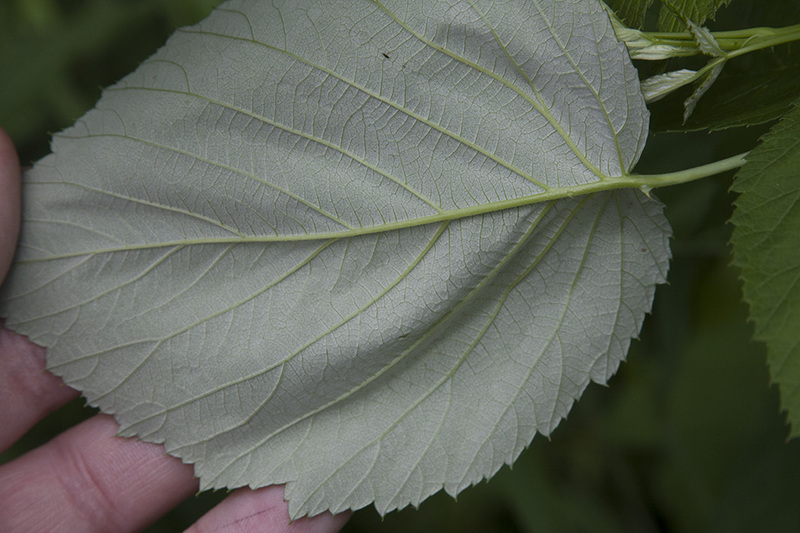 Primocane leaves are palmately divided into usually 3, rarely 5, leaflets. They are on leaf stalks that usually have a few 1 ⁄32″ to 1 ⁄16″ long prickles but do not have bristles, hairs, or glandular hairs. 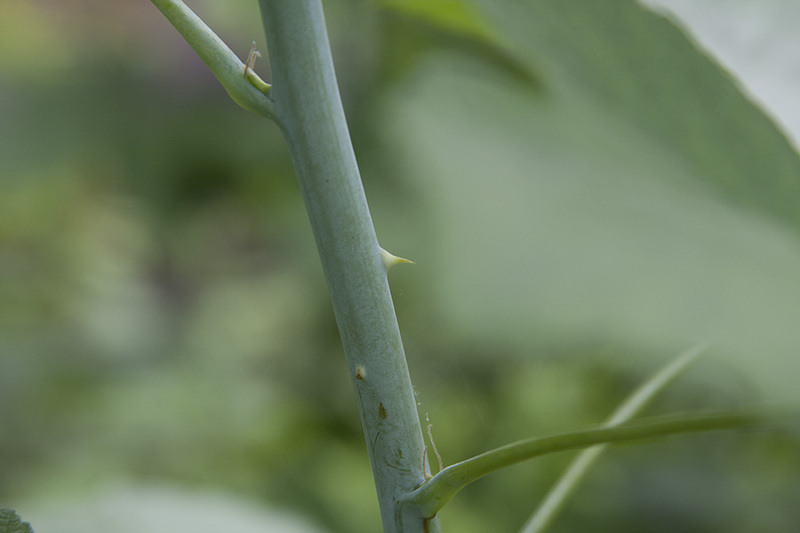 At the base of each leaf stalk is a pair of small appendages (stipules) that are ⅛″ to 5 ⁄16″ long and thread-like. The terminal leaflet is egg-shaped to elliptical, occasionally with a few shallow lobes. The larger terminal leaflets are 2⅜″ to 4¾″ long, 19 ⁄16″ to 3½″ wide. The blade is usually rounded or heart-shaped at the base. It tapers to a point at the tip with straight or concave sides along the tip. The upper surface is dark green and hairless or almost hairless. The lower surface is whitish or silvery gray due to a dense covering of grayish hairs. The margin is coarsely doubly toothed with sharp, forward-pointing teeth. The lateral leaflets are similar but smaller and narrower. They occasionally have a small or large lobe at the base. The terminal leaflet is stalked, the lateral leaflets are stalkless or nearly stalkless. Second year canes (floricanes) do not grow longer but develop short side branches. The inflorescence is a dense, flat-topped or convex cluster of 3 to 7 flowers at the ends of the branches. The stalked flowers in the cluster grow upward from various points on the main stem to approximately the same horizontal plane (corymb). Sometimes there are also 1 or 2 flowers rising from upper leaf axils. The stalk of the cluster has a few prickles but does not have bristles, hairs, or glandular hairs. 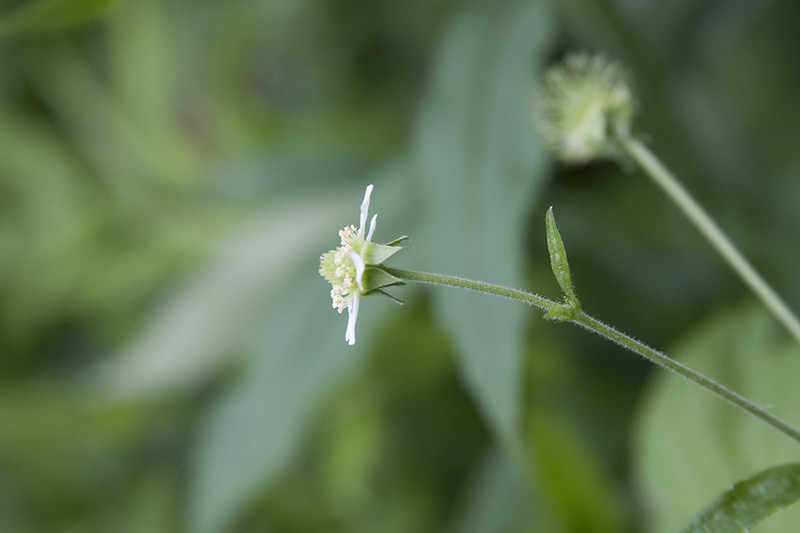 The flowers are about ½″ across and are not showy. They are on 5 ⁄16″ to ¾″ long stalks that has a few broad-based or needle-shaped prickles and some fine hairs but does not have glandular hairs. There are 5 green, triangular egg-shaped to triangular elliptic, 3 ⁄16″ to ⅜″ long sepals. They are, hairy but do not have glandular hairs. They are erect to spreading when in flower, eventually bent backward when in fruit. There are 5 white, narrowly inversely egg-shaped, 1 ⁄16″ to 3 ⁄16″ long petals. 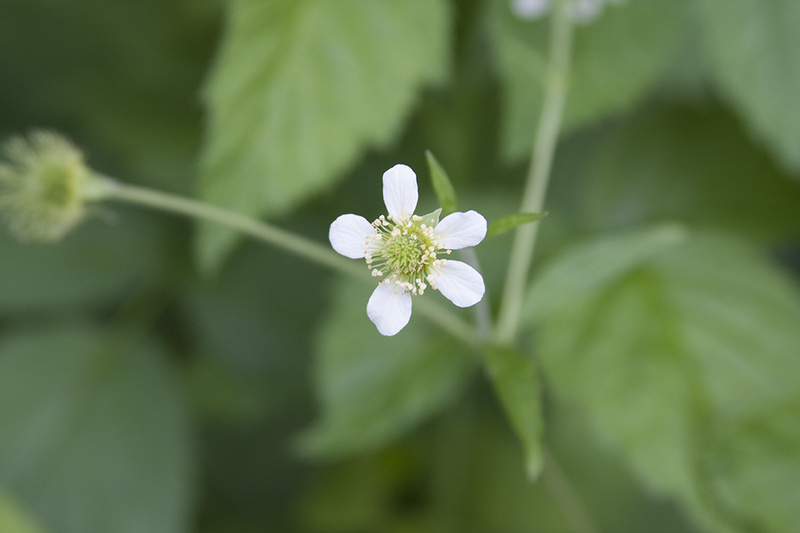 The petals are shorter than the sepals. There are many stamens, all shorter than the petals. The flowers appear in mid May to late June. The fruit is a juicy, short, half globe-shaped, ½″ to ⅝″ in diameter aggregate of multiple drupelets. 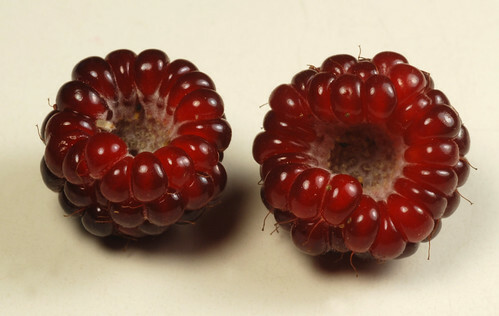 It is white at first, soon turning red, then eventually purplish-black when fully ripe. It matures early-July to late August. When picked it separates from its core, remaining intact. 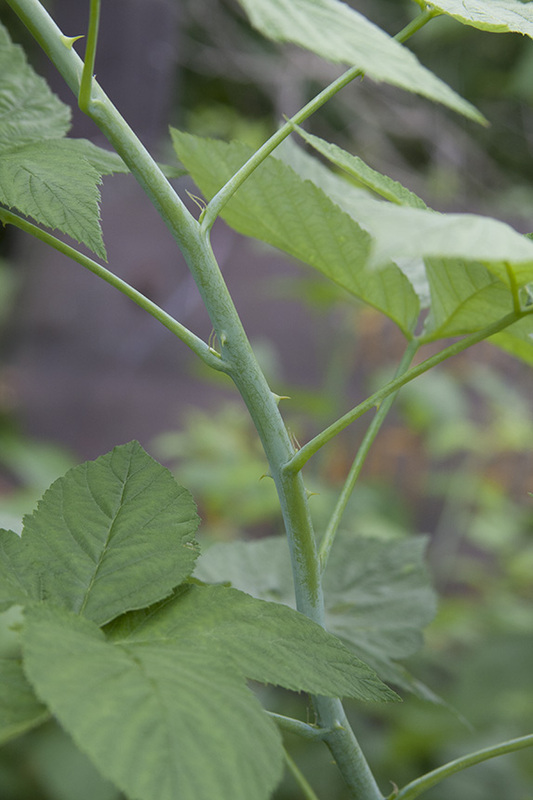 Allegheny blackberry (Rubus allegheniensis) stems have vertical grooves giving them an angled appearance. 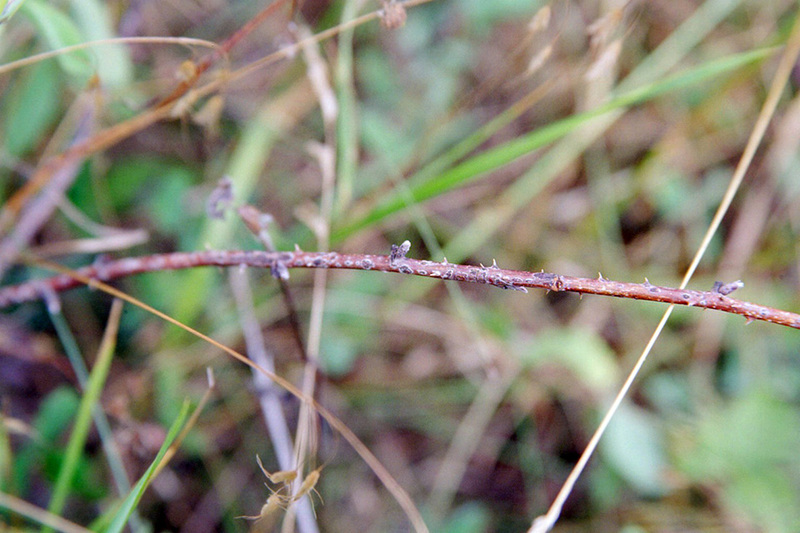 The leaf stalks have sparse to dense hairs and sometimes glandular hairs along with a few prickles. 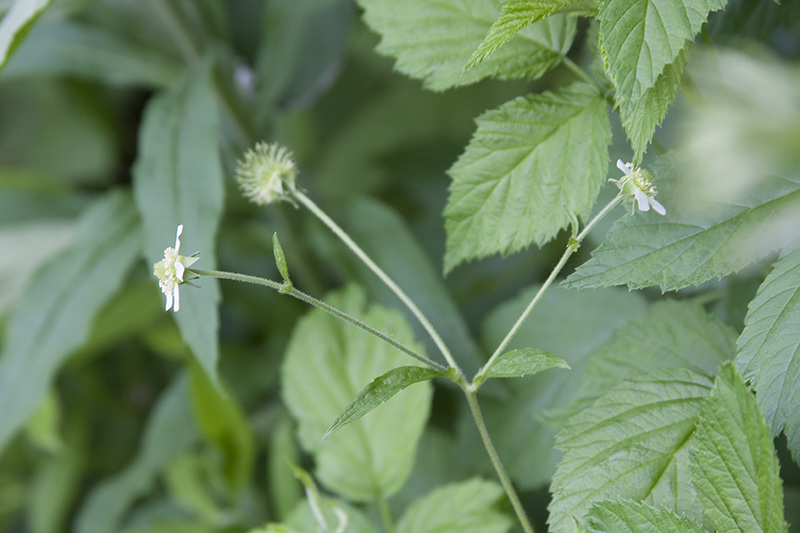 The inflorescence is an elongated, cylinder-shaped, 3⅛″ to 8⅝″ long cluster (raceme) with usually 9 to 14 flowers. The stalks of the clusters and individual flowers are densely covered with short nonglandular hairs and longer glandular hairs. 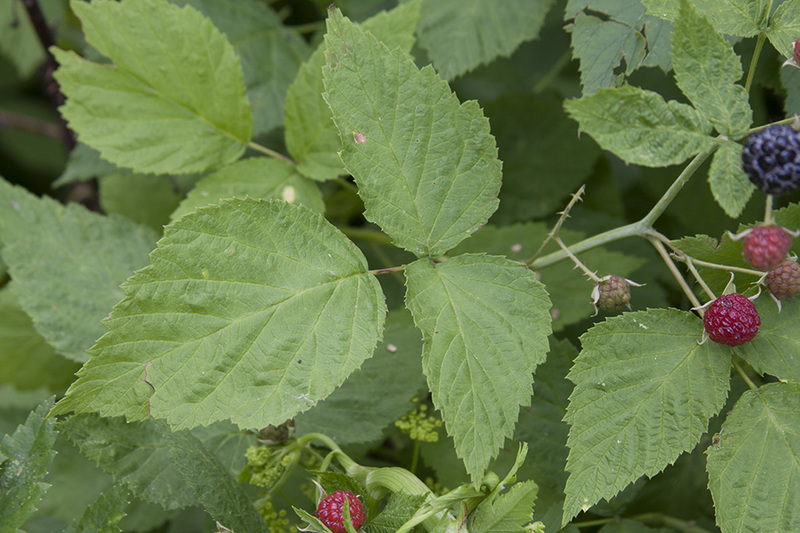 American red raspberry (Rubus idaeus ssp. idaeus) leaves are pinnately divided into 5 or 7, rarely 3, leaflets. It sometimes escapes gardens but is not naturalized. 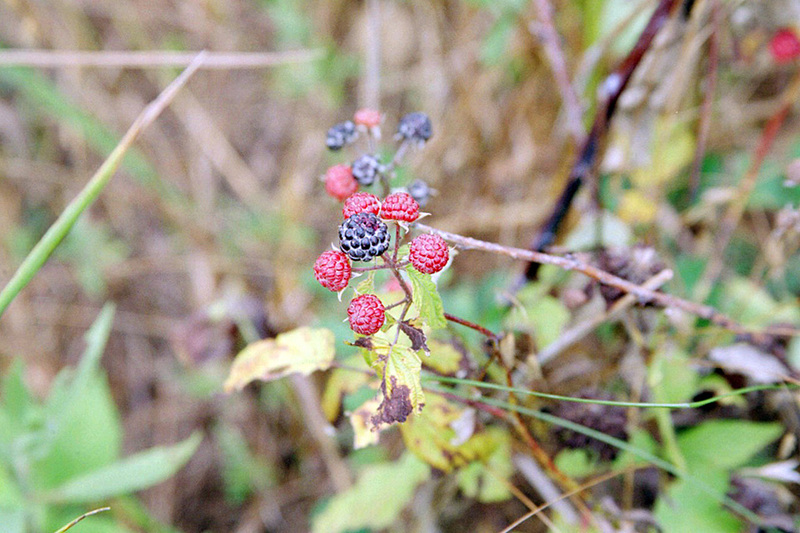 Grayleaf red raspberry (Rubus idaeus ssp. strigosus) is a smaller plant. The canes are shorter, usually remain erect, and do not root at the tip. They have many bristles and no broad-based prickles. The fruits ripen red, not black. 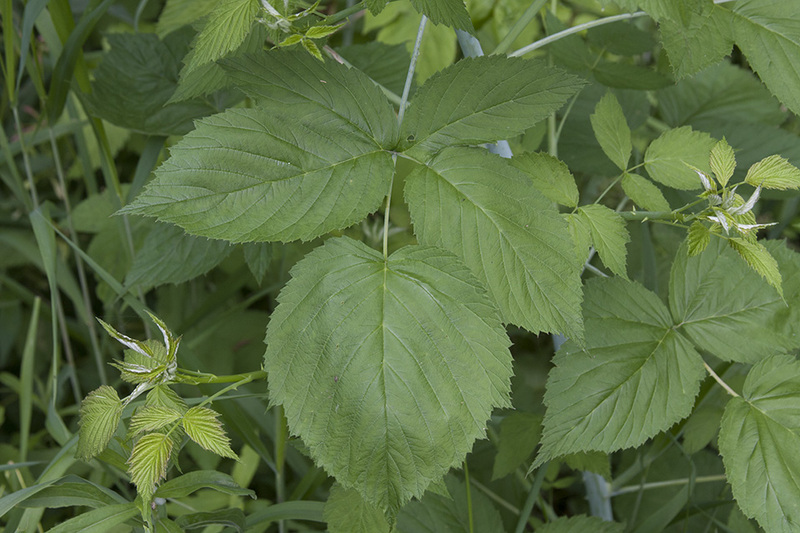 How to identify black raspberry. 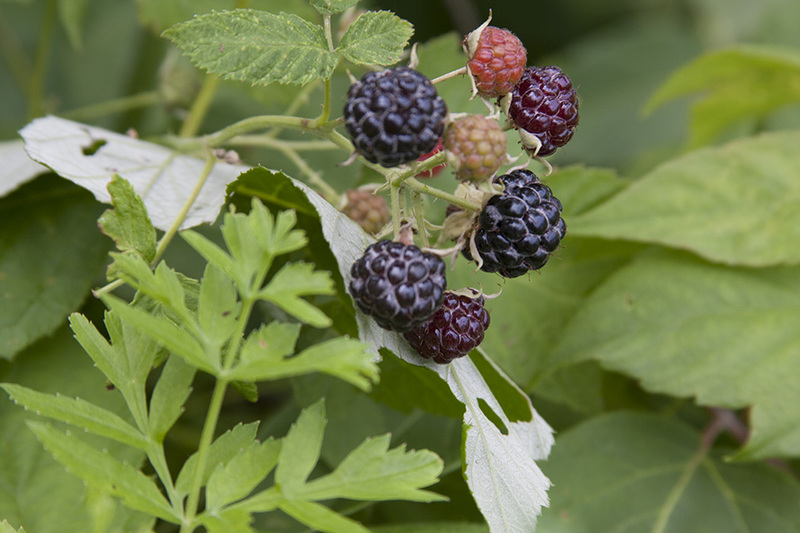 Delicious wild berry and one of the first to ripen around the Great lakes area. Please comment, share, like and subscribe. http://www.youtube.com/user/Earthwalk... These black raspberries are in west central ohio and will be ready in about a week and a half. 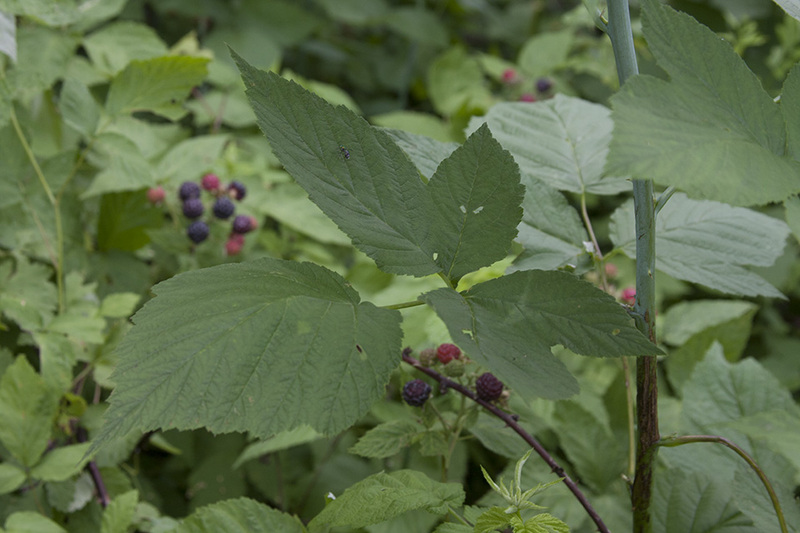 How to find wild black raspberries.